Competition is open to everyone, but limited to the first 24 entries received. All edible chili peppers legal in the U.S.A are eligible. Chili cooks may be asked to eat a spoonful of their own chili before submitting it for judging. Chili must be displayed at Creekside Place, 102 Maple Street, Evansville by 5:30 PM on Saturday February 24,2018. Judging will take place at 5:30 PM. Contestants must stay with their chili during the judging time period. Entry Fee: $35—includes a four-foot table space, two admission tickets (for you and one helper,) and a certificate for $10.00 for your chili ingredients from Piggly Wiggly. A large crock pot is recommended to keep chili at serving temperature during the event. A Nesco may be used instead. Remember to bring your chili already warm & ready to serve! Grand Champion & Honorable Mention will be determined by the highest combined scores in taste, aroma, consistency, color, and aftertaste. Chili is categorized into mild or spicy so that the Best Mild Chili can be judged based on taste and mildness. Best Theme will be awarded to the highest overall score received on a point system from 1 to 10 given in each of these categories: Creativity in name, Booth décor, Presentation, Costumes. *Sponsors and judges decisions are final. Failure to comply with officials in any matter may be cause for disqualification. While there are many myths, legends and hard-headed opinions about the origins and traditions of Chili, there’s one thing for certain: The Heat Is On!, Evansville Community Partnership’s Annual Chili Cook-off is becoming legendary for a whole lot of fun and healthy competition in the area. You’ll need to bring your appetite and maybe a bit of courage to Creekside Place on February 23. It doesn’t matter if you like to burn out your taste buds on creations like “Nuclear Meltdown" or "After Burner Chili," or take a more cautious approach with a nice, quiet white chili alternative. The variety of chilis is impressive and the quality is high. Adding to the fun this year will be a 50-50 Raffle. Admission tickets are just $15 for adults and kids 10 and under enter free with a paying adult. Patrons also savor samples of chili from the chili chef contestants, mixing and mingling with friends old and new, bidding at the fabulous silent auction with in-kind donations from local businesses, and the 50/50 raffle. The proceeds from this event go to the Fireworks Fund for the 4th of July celebration at Lake Leota. The Evansville Community Partnership has categories for Hot, Mild, and Veggie Chili and many of your favorite cooks will be back. 1618 - According to an old Southwestern legend the first recipe for chili con carne was put on paper in the 17th century by Sister Mary of Agreda of Spain. She was mysteriously known in the Southwest United States as "La Dama de Azul," the Lady in Blue. While she never left Spain herself, Sister Mary would go into trances with her body lifeless for days. When she awoke from these trances, she said her spirit had been to a faraway land where she preached Christianity to the Native Americans and counseled them to seek out Spanish missionaries. Spanish missionaries and King Philip IV of Spain believed that she was the ghostly "La Dama de Azul" or "Lady in Blue" spoken of by Native Americans who visited the missions. It is said that sister Mary wrote down the recipe for chili which called for venison or antelope meat, onions, tomatoes, and chile peppers. No physical evidence has been found to back-up this claim. 1731 - A group of sixteen families arrived from the Spanish Canary Islands to what is now known as the city of San Antonio, Texas. They had immigrated to Texas by order of King Philip V. of Spain. The King of Spain felt that colonization would help cement Spanish claims to the region and block France's westward expansion from Louisiana. These families founded San Antonio’s first civil government which became the first municipality in the Spanish province of Texas. According to historians, the women made a spicy “Spanish” stew that eventually became known as Chili in English after the native Chiles (peppers) that were used in the recipe. Eventually, some Spanish priests were said to be wary of the passion inspired by chile peppers, assuming they were aphrodisiacs. A few preached sermons against indulgence in a food which they said was almost as "hot as hell's brimstone" and "Soup of the Devil." The priest's warning probably contributed to the dish's popularity. 1850 - The first chili mix was said to be concocted around 1850 by Texan adventurers and cowboys as a staple for hard times when traveling to and in the California gold fields and around Texas. Needing hot grub, the trail cooks came up with a sort of stew. They pounded dried beef, fat, pepper, salt, and the chile peppers together. This amounted to "brick chili" or "chili bricks" that could be boiled in pots along the trail. Some trail cooks planted pepper seeds, oregano, and onions in mesquite patches (to protect them from foraging cattle) to use on future trail drives. 1880s-1939-San Antonio women nicknamed "Chili Queens" sold stew they called "chili" made with dried red chiles and beef from open-air stalls at the Military Plaza Mercado. They made their chili at home, loaded it onto colorful chili wagons, and transported the wagons and chili to the plaza. They build mesquite fires on the square to keep the chili warm, lighted their wagons with colored lanterns, and squatted on the ground beside the cart, dishing out chili to customers who sat on wooden stools to eat their fiery stew. In 1937 they were put out of business city health ordinances. There was such a public outcry that in 1939, Mayor Maury Maverick reinstated the chili al fresco stands. They were closed again shortly after the start of World War II. 1967 – A well known chili cook-off took place in Terlingua, Texas between a Dallas newspaper reporter and a self-proclaimed world’s best Chili cookbook author from New York. Texans were particularly upset that “the Yankee” had the nerve to use beans in his chili recipe. According to Gary Cartwright, writer for Sports Illustrated, one judge went into convulsions after taking a spoonful of chili, fell to the floor and whispered in agony that he was unable to go on. The cook-off was proclaimed a tie. 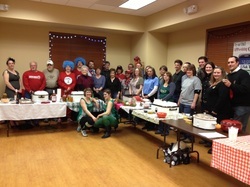 2001 – Evansville Wisconsin hosted their first annual chili cook-off, presented by the Evansville Community Partnership, Inc. and sponsored by area businesses. Their idea was to create a fun family event for the community to celebrate the end of a long winter. Local potter Matthias James created a hand-thrown, no two exactly alike, pottery chili bowl for the winner to take home. The tradition continues and grows each year as the event has become a fundraiser for the Fourth of July fireworks at Lake Leota. 2019 - Evansville Community Partnership’s 19th annual Chili Cook-off will be held on Saturday, February 23 from 6:30 until 9 p.m. at Creekside Place, 102 Maple Street in Evansville. See the entry ad in this week’s Review so you can show off your best chili. Tickets are available at Kopecky’s Piggly Wiggly, and at Creekside Place. Like and Share The Heat Is On Chili Cook-Off page on Facebook. More information is online at ecp-wi.org or you can contact Jim Brooks, ECP Executive Director, via phone at 608/882-0598 or via e-mail at ecpi@litewire.net. Please Patronize these fine sponsors. Local sponsors make local events possible.